How to include proteins to your Breakfast? All of us are well aware that breakfast is the first important meal of the day. The second most important thing is to have frequent meals to keep our metabolism high. Our body goes into the rest mode for almost 8 to 10 hours after dinner when we are sleeping through the night. Hence, it becomes essential to eat a good, balanced meal which has the right proportion of carbohydrates, protein, fats, vitamins, minerals, fibres, anti- oxidants etc.in the morning. More often than not it is a difficult task to incorporate all these nutrients in the morning breakfast due to our rush to get to work.But, one can always try to incorporate as many nutrients as we can out of the above if not all. 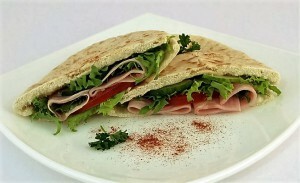 It is advised to include proteins in every meal. The inclusion of proteins to your breakfast becomes a challenging task especially if you are a vegetarian. Lacto- Ovo vegetarian breakfast can easily get proteins through the milk and eggs. The tough task is for vegetarians and vegans (those who limit dairy products). Common Indian breakfast items are Poha (cooked Puffed Rice with some veggies), flat breadsUpma, Idli and Dosa (steamed Rice pancakes), flatbreads(Chaapti), Rice, Porridgeetc. Today, I am going to tell you how we add proteins in our 1st meal of the day – breakfast. Whenever we have options like steamed rice pancakes (Idlisambhar) or bread omelette we’re obviously getting proteins from the dish. 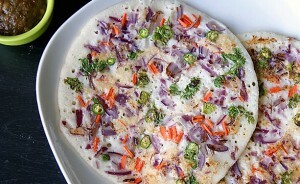 When we have options like Cooked Puff Rice, Upma, rice, cooked Wheat Flat breads (Chappati) etc. without any side dish we need to add some proteins to it. Peanuts/ Groundnuts: A humble source of proteins and MUFA (mono unsaturated fatty acids) will add to proteins in breakfast. We can use in different forms as peanut butter, chutney etc. spread it on your bread or chapatti. Excellent to be added in pre workout meal. 100 g of Dry roasted peanuts will give 24-26 g of proteins. Roasted Chana: Simple, easily available and can be stored. Just add a handful of black (Kabuli)or brown Chana to your plate or have it on the go post breakfast. If you couple it up with peanuts it will be even better. Mixed Sprouts: This one will need some preparation. Soak the sprouts for 6-8 hours, then drain the water and tie in the cloth for sprouts to come. Add handful of it either raw or steamed. Raw will give you good enzymes as compared to cooked ones. Whereas steamed will be easier to digest. Following are the rough values for sprouted and steamed sprouts. Green peas: It is very to incorporate peas in any dish. Add it to your upma, poha, rice liberally. They will taste good as well as increase the protein value. Its green colour also add to the visual effect. Nuts like (almond, walnut, cashew nut): Again a very handy option. Just adding them to your bowl of breakfast is very easy. They are rich in minerals like calcium, good fats like MUFA, omega 3 fatty acids. Don’t forget to soak and peel almond to avoid anti nutritional factors in the peel. Sesame, flax, sunflower, pumpkin seeds: Dry roasted seeds can serve as a protein quotient of the meal. You can easily stock it in cool and dry place. You can have them as it is or grind to make into chutney. Dips like tahini can be made from sesame seeds. Milk: You can just add a glass of milk to complete the protein quota of the meal. It goes well with roti, chapati, bread, cereals etc. It is better to go for low fat milk. If having cow’s milk make sure it is Desi cow’s milk. Make sure you’re not having it with salty or savoury as milk and salt is not recommended to have together.1 cup of milk gives you 8 g protein on an average. 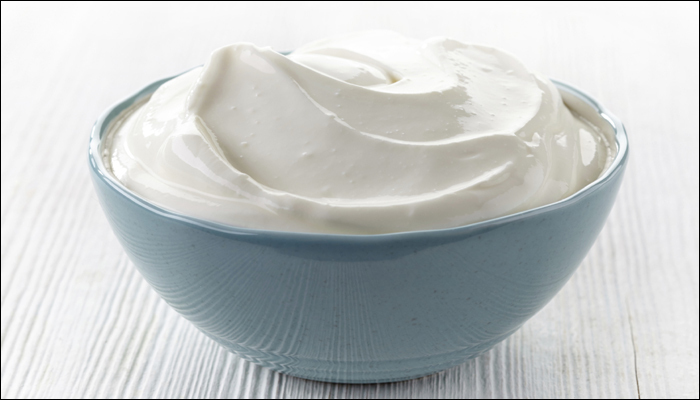 Curds/ Yogurt: Add a bowl of curds or yogurt to make your breakfast not only protein rich but yummy. We can mix poha, rice with it to give a better texture and taste. Fruits with yogurt can be another hit option and light still complete meal. 1 cup gives you 10-11 g proteins on an average. Buttermilk: It is the best bet in summer. Having it post breakfast will help in digestion. It has good water content and therefore it will not be a concentrated source. Unlike milk it can be coupled with salty and savoury options as well. Cheese: I am yet to come across a person who doesn’t like cheese unless of course you are a vegan. We can add it with breads, chapatti, pancakes etc. You can use different varieties like cheese spread, cubes, and slices or just grate some cheese on your dish. People who are targeting weight gain can have it on regular basis. Those who are trying to lose weight should limit it once or twice in a week. 100 g will give approx. 20 g of proteins. When it comes to blood tests, most are aware of blood sugar, cholesterol or haemoglobin levels. In the current times, we also know about Vitamin B12, D, and Calcium etc. But, have you ever come across “blood/serum creatinine levels”? Recently, I came across somebody I know well with high levels of high blood/ serum creatinine levels. And, observed there is a lot of confusion between “Blood/serum creatinine levels” & “creatinine” that one takes as a supplement while working out in the gym. These are two different things. In this blog, I am talking about –Blood Creatinine. What does it means when you have high blood creatinine levels? Creatinine is produced in the body constantly. It is a by-product of creatinine phosphate in the muscle. Its value depends on the muscle mass that one has. Creatinine is carried through the bloodstream to the kidneys. It is filtered out by the kidneys and thrown out of the body through urine. The kidneys maintain the creatinine levels in the blood to a normal range. A creatinine level is an indicator of kidney function. High creatinine levels is a warning for impaired kidney function. Medicines like ACE inhibitor (ACEI) or angiotensin II receptor antagonist (or angiotensin receptor blocker, ARB) taken. In male – 0.6 to 1.1 milligrams per dl of blood. In female – 0.5 to 1.1 milligrams per dl of blood. Infant – 0.2 milligram per dl of blood or above (due to less muscle mass). A person with one kidney – 1.8 to 1.9 milligram per dl of the blood. Reduce water/fluid intake: Fluid intake needs to be monitored. Do not restrict fluids unless there is a fluid overload problem. If fluid retention is a problem, limit salt intake. Limit salt intake (Sodium): You should control the amount of salt going through the food. Add minimum salt as required. High sodium will cause water retention. Cut down on salt, cheese, pickles, instant soups, roasted and salted seeds and nuts & all types of fast foods. Specifically, avoid canned foods. Limit Potassium: Low-salt substitutes are not good either, as they contain high levels of potassium. Restricted eating high potassium containing such as tomato, potato, nuts and chocolates etc. Limit Phosphorus: Excess phosphorus can cause total kidney failure as well as bone disease and heart ailments. Reduce dairy products including milk, curd, and cheese. Cut down intake of foods like Shellfish, nuts, soya bean foods etc. Control Calcium: It is another concern for kidney patients, causing serious bone disease in later years if not controlled. Low protein diet: Low protein diet is recommended to reduce creatinine level. This avoids build-up of excess urea. Cigarettes and Alcohol: kill you anyway and, also does not help in the case of high Creatinine either. With diet control, the portion size also matters. If you eat in excess, the nutritional value changes considerably. Be active & Exercise regularly: High-intensity exercise could lead to impressive results. It may also help lower your risk for high blood pressure and diabetes which are the two main causes that lead to developing CKD (Chronic Kidney Diseases). It is advisable to take peaches, broccoli, onion, grapes, cabbage, pepper, cherries, cauliflower, apples, celery, berries, cucumber, pineapple, eggs, plums, green beans, tangerine, lettuce, watermelon and pears. Restrict the intake of oranges and orange juice, asparagus, avocado, kiwi fruit, raisins or other dried fruits, bananas, cooked spinach, potatoes, pumpkin, prunes, etc. Are you having your fruits the right way? Fruits are a great choice when it comes to eating healthy. But, that’s not all, there is more to it. Having fruits at the right time, in the right form and the right combination is important. A common mistake, I have observed among people is the wrong way of consuming fruits. The above mentioned are certainly not the right way of consuming fruits and is harmful. Let us take a look at each of these in a detailed manner. Our meals contain lots of sugar & calories. All carbohydrates sources like rice, bread, chapatti etc. are finally broken down to sugars in our digestive system. Other components like dal, curds, chicken, eggs, and fish have proteins. Calories come from all these foods. Fruits contain natural sugar – fructose. Though natural it is still sugar. Adding a fruit to it will increase the calorie load. When fruits are consumed along with lunch or dinner, the excess sugar from fruits has a higher chance of turning into fats. The body always stores excess sugar as fats. Moreover, the combination of fruits with other foods might turn poisonous. When fruits are mixed with other food it creates digestive disorders. This cause indigestion, gas and bloating. There is a simple reason why you should avoid fruits in the late evenings or at night. Our activity reduces towards the end of the day. Calories or sugars that we eat the food get utilised (burnt) when we are active. Fruits have a natural source of sugar-fructose. We do not need this sugar during the night when our activity levels are low. The extra sugar from fruits gas high chances of getting converted into fat. Thereby increasing the body’s fat %. People who have the night shift or sportspersons having a game in the late evening can go for fruits at this time. This is one of the common mistakes that I have observed. In fact, this very aspect provoked me to write this article. We have fruit juice out of the notion that it is very healthy or just a plain convenience. But, did you know that it is harming us in a big way? Fruit juice lacks fibres. A juice is taken out from relatively more quantity of fruits than what one can eat in one serving. As compared to this, we get all the fibres when we eat a whole fruit. Fibres help in removing the toxins & wastes from your body. When we have juice we tend to have it faster as compared to eating fruit pieces. Having a fruit juice raises blood sugar level faster. Whereas eating fruits in pieces is fibre rich and brings the Glycemic Index (GI) of the food down. Glycaemic Index is the rate at which sugar is absorbed into the blood. It is very important for having blood sugar levels maintained for Diabetic, pre-diabetic or even for a normal person. Believe me, the satiety value is much more when you bite into a fresh, juicy fruit. All those who are having sweet cravings, try having a fresh fruit and see how dramatically you get that feel good factor! Fruit juices can be had by elderly, sick people with digestive disorders. Sportsperson with very high activity levels can have it post-game/ exercise.